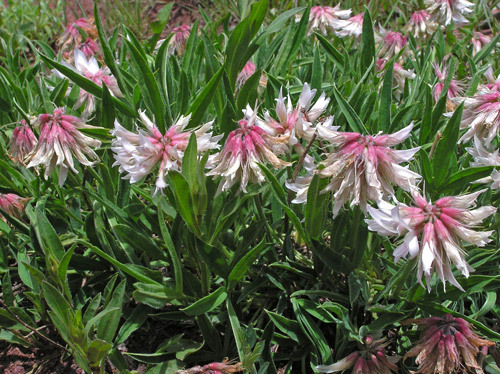 The three Trifoliums shown on this page are found in open alpine meadows from about 11,500 feet elevation to 13,000 feet. 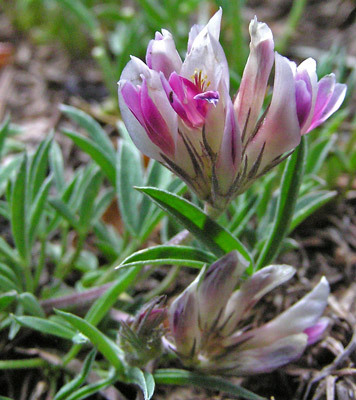 Trifolium attenuatum and Trifolium dasyphyllum grow to five or six inches tall and have long flower stems with multiple flowers in the head; Trifolium nanum is but an inch or so high and flowers are single, barely above the matted leaves. 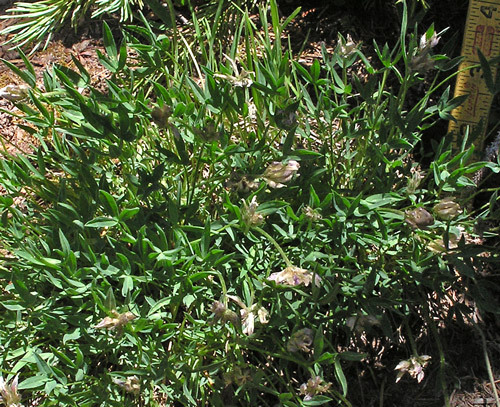 Although all three plants are low to the ground and have small flowers, they are quite visible because they grow in widely spreading mats -- T. attenuatum and T. dasyphyllum to over several feet in diameter, T. nanum to half that. 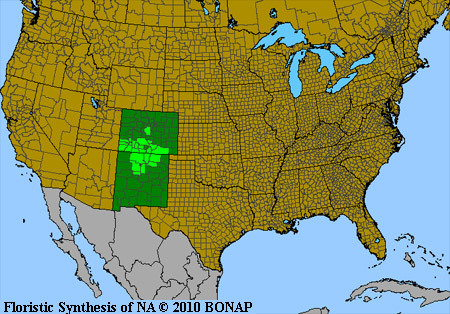 T. attenuatum is found only in a few counties of New Mexico and Colorado. 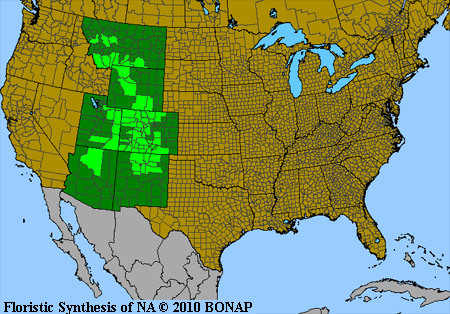 T. dasyphyllum and T. nanum are more widespread, ranging from New Mexico to Montana. 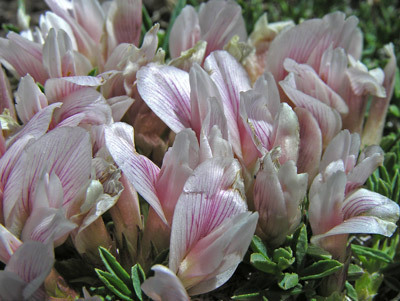 Linnaeus named the Trifolium genus in 1753. Above: Kennebec Pass, June 19, 2018. Left: Lizard Head Trail, July 2, 2004. Edward Greene (1843-1915) named this species. "Attenuatum" is Latin for "thin, weak", perhaps referring to the weak flower stem. Lizard Head Trail, July 2, 2004. Colorado Trail, July 6, 2009. 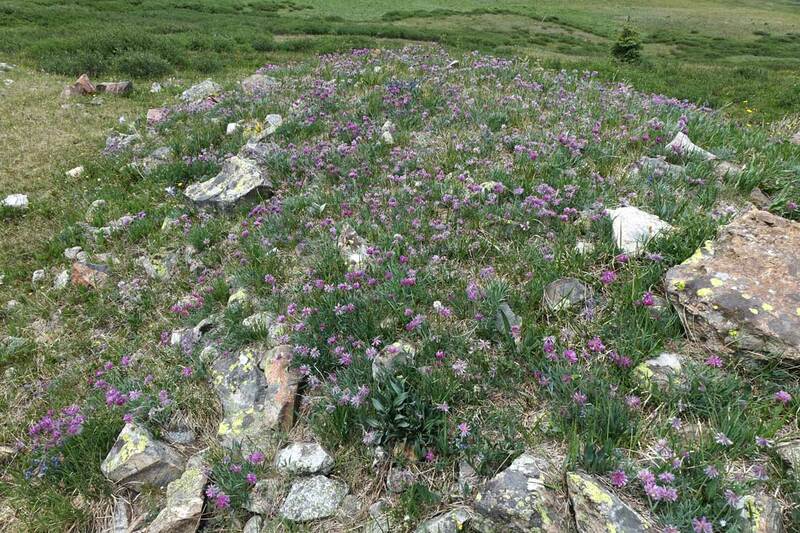 This steep mountainside had row upon row of Trifolium attenuatum. I have enhanced the pink hue slightly to make the flowers more noticeable. White flowers with pink calyces are rare. Court House Trail, July 15, 2007. T. attenuatum Calyces and herbage villous-pilose; banner attenuate [gradually narrowed and tapering to a point]. 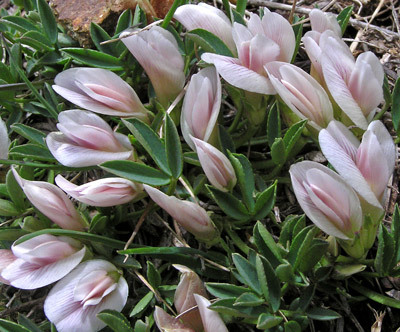 T. dasyphyllum has a broader range and can be found in the northern as well as the southern Rockies. I have found it only once (as pictured in the photographs on this page) in the Four Corners area. 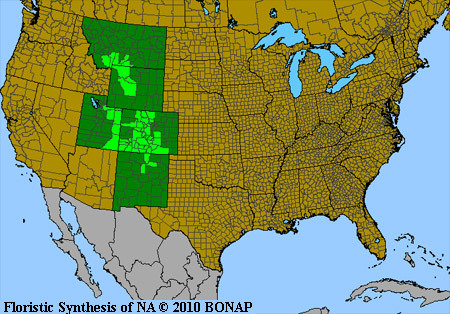 William Weber indicates that T. dasyphyllum is "evidently absent from the San Juans", but Kartesz shows it almost throughout the San Juans. 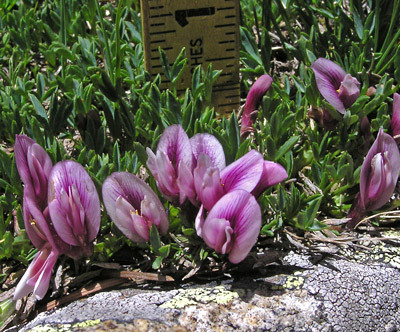 John Torrey and Asa Gray named this plant in 1838 from a specimen collected by Edwin James on the "Summit of the Rocky Mountains [Pikes Peak]" in 1820. (Quotation from Intermountain Flora.) "Dasyphyllum" is Greek for "hairy leaves". Petal color can vary from all rose to violet-purple to white with pink wings and keel, as shown here. The sepal teeth are long and quite narrow and pointed. Lizard Head Trail, July 6, 2005. 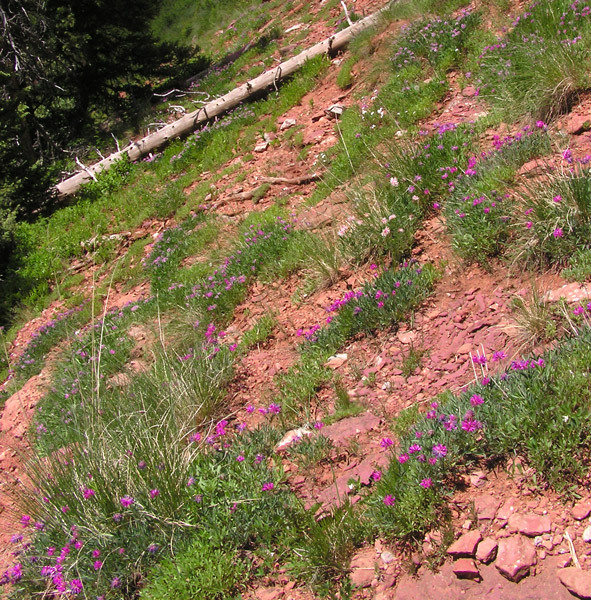 Sharkstooth Trail, June 28, 2007 and June 22, 2009. 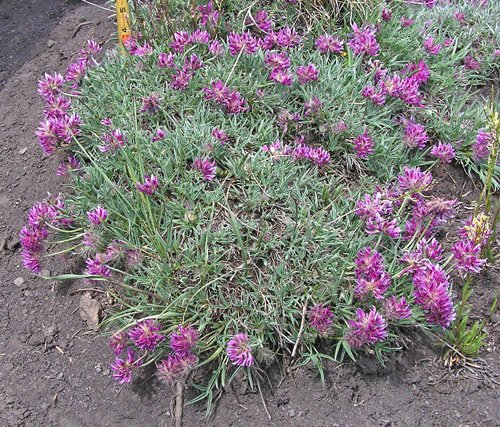 Trifolium nanum hugs the alpine ground with numerous, tiny, three-parted leaves in a tight mat, but it has relatively few flowers, which are, however, large for the size of the plant and always in attractive masses. Almost all the greenery in the top photo belongs to one plant which might eventually grow to about a foot in diameter. "Nanum" is Greek for "dwarf". 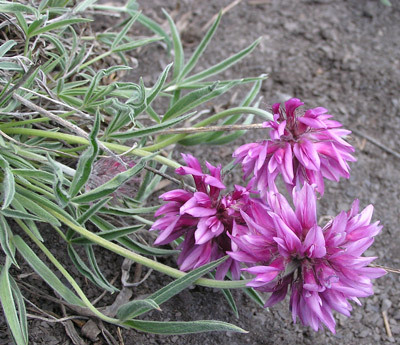 In 1820 Edwin James collected this plant on Pikes Peak and John Torrey named it in 1824.